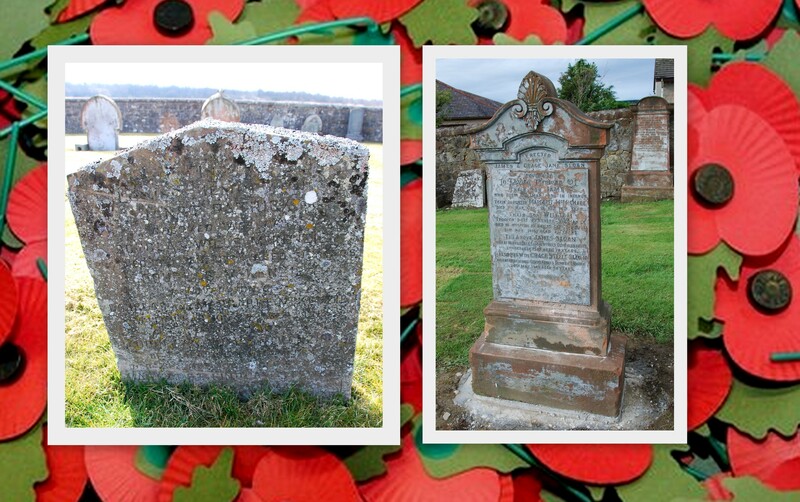 Take a walk through the Auld Kirkyard and there you will find names of several soldiers remembered on family tombstones – alongside unforgettable names such as Somme, Gallipoli and Palestine carved into aging stone. As part of our project we secured funds to make repairs to five of the stones and to produce a Soldiers Trail leaflet to enhance your visit to the Auld Kirkyard. Born at Crook , a cottage on the Arthur family’ lands of Wellhill. He served as surgeon to the 1st Madras Fusiliers who entered Lucknow as part of the 1st Relief Force during the Indian Mutiny and later served in the siege and capture of Lucknow. John was awarded ‘The Most Exalted Order of the Star of India’, C.S.I. in June 1869. He died at Lochside House, 1886, aged 79 years. One time resident in the Old Mill and his father later farmed Dalhanna. 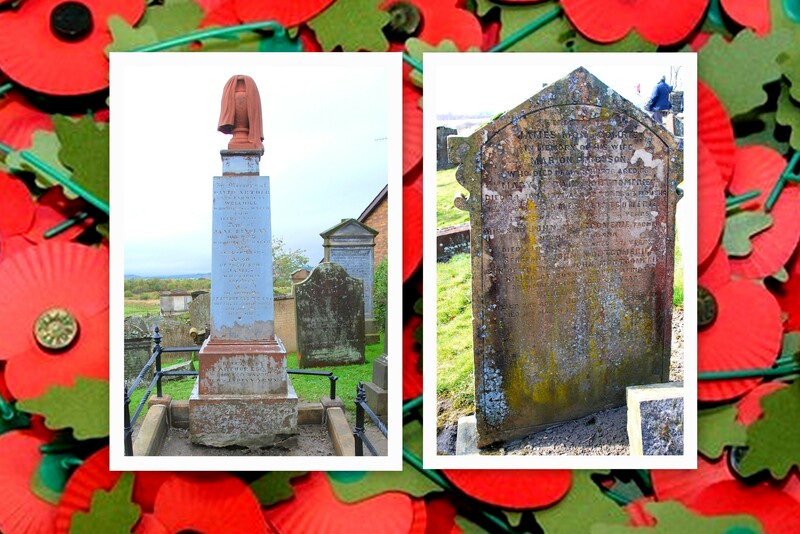 John died of his wounds at Boshof, South Africa, on 28th March 1901, aged 33 years. His family lived at Old Coalburn. Douglas was killed in action at the Battle of Passchendaele, 25th September 1915, aged 19 years. The Sloan family farmed at Roughside. William died of his wounds in hospital at Helles, Gallipoli on 15th November 1915, aged 21 years. The family originally from Forfar lived at Castlehill and then Mossmark, where his father worked as a tailor’s cutter. Andrew was killed in action at the Battle of the Somme, 14th July 1916, age 21 years. A champion ploughman he lived with his family at Dalrickett Cottage. George was killed in action at the Battle of the Somme, 8th September 1916, age 20 years. The McKerrow brothers were born at Maneight . Alexander emigrated to Canada where he served in the Canadian Overseas Expeditionary Force and was killed in action at the Battle of the Somme, 9th October 1916, age 25 years. William was killed six months later in the Balkans campaign on 25th April 1917, age 22 years. The Mathieson brothers’ father worked as a cloth merchant at Pathhead before moving to Kirkconnel where the boys were born. Joshua was killed in action at the Battle of the Somme on 15th September 1916, age 18 years. Thomas, died of infectious jaundice on 9th November 1917, age 24 years. The family lived at Connel bridge where Robert worked in his father’s shop. Robert was killed in action at Palestine on 22nd November 1917, age 24 years. Born at Rottenyard farm, he enlisted while working as a ploughman at South Boig. Archibald contracted pneumonia and was brought home but died in Glenafton Sanitorium. A farmer at Coalcreoch he emigrated to Canada and served in the Canadian Overseas Expeditionary Force. Robert died of his wounds in a casualty clearing station in France, 6th April 1918, age 39 years. His father Hugh was a grocer and spirit dealer at Craigbank. Archibald moved to Cathcart where he enlisted. He contracted pneumonia and died at Victoria Infirmary 22nd July 1918, age 19 years. Son of a Glasgow clogmaker he moved to Pathhead to work in the coal mines and later married a local girl. James died of his wounds in France, 17th September 1918, age 27 years. He lived with his family at Boig Road and worked in the local mines. 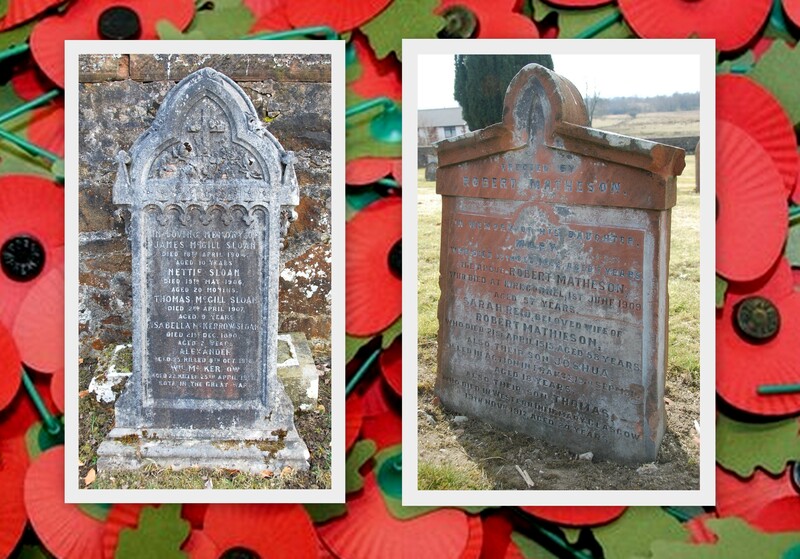 Thomas died at Kilmarnock Infirmary of tubercular peritonitis 19th August 1919, age 20 years.